Whether you’re a franchised hotel chain or an unaffiliated hotel, your location needs the advantage of a solid foundation and a strong network of contacts to succeed, and that’s where the Outer Banks Hotel/Motel Association can help. As members, you have access to the effective tools and supportive relationships that are the key elements for your businesses to thrive. 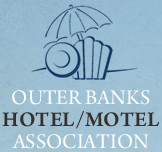 All Association members will be featured on the Outer Banks Hotel/Motel Association’s website. A description of your business, your contact information, and an optional link to your company’s website are available to Internet users 24 hours a day, seven days a week. Member only events and community activities are also posted, making the website an attractive destination for potential vacationing customers. The Association will send a monthly email to all members for networking events and a separate email to the vacationing members with area community event information. Members can also reserve a date to email offers or announcements to the vacationing public who sign up through the Association’s website Vacationer’s email signup. The Association offers many opportunities for members to be involved and network. All meetings are posted on the Association’s website.